The scanner itself is great - Fujitsu make the best sheet-fed desktop scanners I think. My only grumble on the Fi-6130 is the software. If I didn't have Kofax VRS installed I would be stuck. They need to make it much, much simpler to use. I recently bought a second hand ScanSnap S1500 for home use and it is awesome! Best scanner I've ever used and would happily swap it out with the Fi-6130. 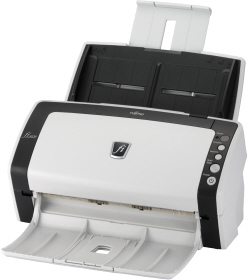 It operates with an intelligent one-touch scan and detects single/double sided as well as B&W or colour automatically. The service I had from TradeScanners was exceptional and hard to beat. The follow up was good and when I called with questions on the software the support was great, including online access to change some settings on my PC. I know where to go in future. I don't personally use the scanners we bought, but the feedback I have had from the relevant Admin team has been very favourable. They are much faster than our old ones, and we are very happy with them. Also, the service provided by yourselves has been excellent. Delivery was quick, and the items received in top condition. Well done. It is useful to see users giving their opinion on a product, what it is used for, and to see it in operation. You can see how quick the scanner is from the clips. All in all, I think these product reviews are good idea. Scanner rating 4 (I haven't given it a 5 because of its cost) - otherwise a fast reliable scanner. We're very pleased with both the scanner and the service from Trade Scanners. We bought a similar Canon model (DR 5020C) also from Trade Scanners about four years ago and had been impressed with its performance compared with the very much larger and more expensive auto feeding flatbed scanners we used previously. The Canon model was getting a bit tired and we decided on the Fujitsu scanner after reading a few reviews. The Canon scanner was brilliant - this one is even better. This has been a great success with our office and the clients offices; it means we can now all seamlessly and speedily scan into our centrally held DropBox and access good quality images from each other within seconds. I would rate this scanner as 5 stars. I did a lot of research before buying and am delighted that all the excellent reviews were right. I was also please with the service from Trade Scanners and have already recommended both the scanner and Trade Scanners to several people. I have now had the scanner almost a week and to say that I am impressed would do the scanner an injustice! Our task was to scan the notes amassed by a local historian over 25 years or so. The sheets of paper vary in size and thickness; some consisting of pieces of paper pasted on to a second sheet of paper; some are dog eared or creased; some are slightly torn. In short – a lot were quite tatty and not nice flat sheets of paper! The scanner happily coped with the lot and the only paper jam I have had (after scanning some 500 sheets) was when one of the pasted sheets came apart. Clearing that jam was a 2 second job. The physical scanning speed is not a problem, though processing could be a hold up if your PC is on the slow side, especially if you are OCRing material as well as scanning it. There is also a relatively steep learning curve to climb to get the best out of the software. But I recommend this machine to anyone facing a similar task. The new scanner was purchased to assist - not replace - an existing Fujitsu scanner (the 6130 older brother a 5120) as we operate a document management system that requires all correspondence to be scanned. The purchase was made with the knowledge that the existing scanner (way over 10,000 scans thus far) was fit for purpose, but no longer made. The new scanner does the same job, but much faster. We run it through a Silex network box and, networking issues aside, set up was almost "plug 'n' play". The Fujitsu Fi-6130 has been an excellent buy and is very quick for such a small scanner. The only slight problems that I have had have been the very occasional paper jam (usually due to my leaving pages stapled together) which "locked up" the software to the point where I had to remove and reinstall the program to fix it but this was very quick and easy to do. Now that I am more careful I don’t have any further problems. It works very well with the Paperport software that I bought which gives me almost "X Ray" vision of my documents held on my PC. Enhanced with innovative features, the Fujitsu fi-6130 scanner offers outstanding price/performance value in a compact footprint, conserving both space and budget. With duplex scanning performance of up to 80 images per minute in monochrome and grayscale, the fi-6130 also delivers uncompromised high-resolution performance of up to 60 images per minute in color at an astounding 300 dpi. Engineered with one of the most advanced paper separation features in their class, the fi-6130 is the first workgroup scanner equipped with reversing roller technology*, resulting in exceptional feeding reliability for an even wider variety of document weights. Furthermore, the automatic document feeder (ADF), capable of scanning documents up to 10 feet long, is also robust enough to feed up to three hard cards continuously or an embossed card up to 1.4 mm in thickness. Additionally, the fi-6130 harmoniously combines the security of Ultrasonic Double Feed Detection with the efficiency of Intelligent MultiFeed Function (iMFF) so that intentional double-feeds, such as a taped receipt or sticky note, can be manually bypassed while double-feed detection is enabled. The Fujitsu fi-6130 workgroup scanner conveniently includes everything in the box to get organizations up and scanning. With the full version of Kofax VRS® Professional, Adobe® Acrobat® Standard, and ScandAll Pro software, users get image enhancement functionality as well as the option of scanning directly to PDF, file, print or batch.